(behind Priory Meadow car park). Ground floor - wheelchair accessible - all welcome! Our next meeting is at 7:00 pm on Tuesday 7 May 2019, in the Quaker Meeting House, 5 South Terrace, Hastings, TN34 1SA. Details to follow. 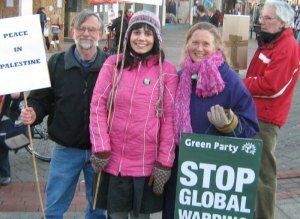 Send donations to our Treasurer: Lorna Vahey, 145 Emmanuel Road, Hastings TN34 3LE. 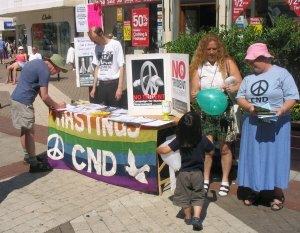 Hastings Against War (HAW) was formed in February 2003 in response to the growing threat of a US/UK invasion of Iraq. Since then we have organised countless information stalls, film screenings, talks, and street actions, as well as an art exhibition, benefit concerts and a major conference at the White Rock Theatre - 'Waging War, Making Peace'. We have worked to raise awareness of the human cost of UK/US policies in Iraq, Afghanistan and elsewhere, exposing the often hidden facts about civilian casualties and corporate profiteering. We've campaigned against the arms trade which profits from war and against Israel's repression of Palestinians. Each year HAW participates in 'Fly Kites Not Drones', an international event begun by young peace activists in Afghanistan in response to their younger brothers and sisters being too afraid to fly kites because of the threat of drone attacks. Also part of HAW's annual calendar is a ceremony in November to remember all victims of war, and an event commemorating the devastating attacks on Hiroshima and Nagasaki in August 1945. Past and present HAW members have visited Palestine, Afghanistan and Iraqi Kurdistan, working in solidarity with local people living with the effects of conflict. Our current focus is campaigning against the arms trade, against armed drones and against the renewal of Trident, the UK's nuclear weapon system, which has a potential for destruction far greater than that unleashed on Hiroshima.